As more and more consumers leverage cloud storage and collaboration tools for personal files and photos, it’s natural that consumer-grade solutions begin to enter the workplace. However, there are significantly different concerns, expectations, and needs when it comes to managing a family photo versus a financial statement, sales pricing, or a patient record. The feature set of Dropbox for Business still falls closer to consumer-grade than enterprisegrade. 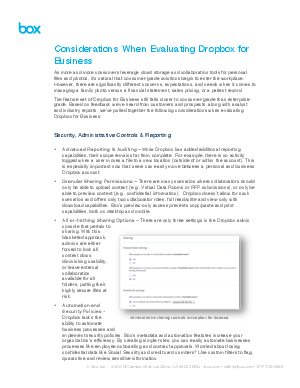 Based on feedback we’ve heard from customers and prospects, along with analyst and industry reports, we’ve pulled together the following considerations when evaluating Dropbox for Business.